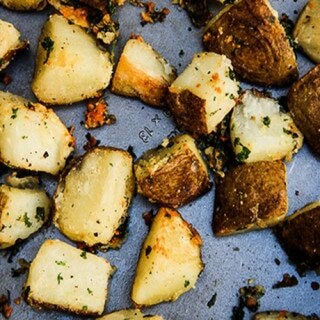 This crispy roasted potatoes will be devoured straight out of the oven. Add the potatoes to the boiling water and cook for just a few minutes to par-boil. Be sure to remove them just as they start to become soft, but not fully-cooked. While the potatoes are cooking, put the olive oil in a rectangular dark baking tray and heat in the oven. Drain the potatoes and shake them in the draining bowl to rough up their surface, giving them the perfect surface to crisp up while roasting in the oven. Add the potatoes and fresh garlic to the hot oil and toss to coat. Roast the potatoes in the oven, turning them a few times. When the potatoes are almost done, sprinkle with Parmesan cheese, salt, and pepper to taste. Roast and turn a few times to ensure they are evenly crispy on all sides. Continue roasting in the oven until the potatoes are tender on the inside and crispy on the outside. Toss with freshly chopped parsley and serve hot out of the oven!